Bataireacht (from the Irish bata, meaning stick) is the term used in Irish martial arts traditionally applied to various forms of Irish stick fighting. Today the word bataireacht is being used among both Irish and English language speakers to distinguish between traditional and non-traditional stick-fighting styles. Modern practice of Bataireacht has arisen among some practitioners from a desire to maintain or reinstate Irish family traditions, while for others a combination of historical and cultural interest has lead to their interest in bataireacht.Practitioners exist in Ireland, the United States and Canada, in movements started somewhat independently of each other. 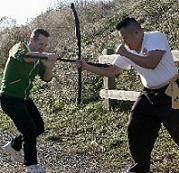 Bataireacht is also gaining popularity among the non-Irish, especially in the United States, as a form of self defense, since a cane or walking stick can be carried easily in modern society. As is the case with most martial arts, multiple versions exist. A few forms of bataireacht survive to this day - some being traditional styles specific to the family which carried them through the years, like the "Rince an Bhata Uisce Bheatha" (whiskey stick dance) of the Irish Newfoundlanders Doyle family. Others styles survive in the techniques used in the sport of hurling and of course in military sabre fencing which continues to have a great following in Ireland.